WestGate@Crane Technology Park would not be here without NSWC Crane, Indiana’s strategic defense asset supporting high-tech solutions for the nation’s warfighter. It may seem odd for a naval base to be rooted in land-locked, rural Indiana, but it has stood the test of time. Crane began as an ammunition supply point more than 70 years ago, but it has evolved into a hub for training, technology, and tremendous opportunity. Former NSWC Crane Commanding Officer, Captain JT Elder often said, the sun never sets on the work of NSWC Crane. The high-tech solutions the base provides to the Department of Defense are in action all over the world, protecting our service members and supporting their success. 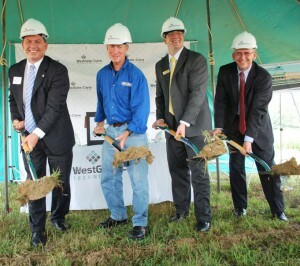 Located just a mile outside the base, in South Central Indiana, WestGate@Crane Tech Park was established in 2005. 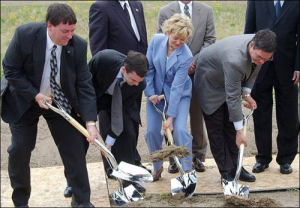 EG&G was the first company to break ground on its facility in 2006, and the park has seen steady, consistent growth ever since, with more than 30 small businesses and Fortune 500 companies creating jobs, prosperity, and partnerships. It is truly a “miracle in a cornfield,” as former Radius Indiana President/CEO, Becky Skillman, has often called it. WestGate is the state’s only tri-county tech park, encompassing parts of Daviess, Greene, and Martin counties. This unique partnership provides a strong base of local support for the WestGate@Crane Authority, a nine-member board created to develop and manage the tech park. These leaders are passionate about the development of the park and the entire region. 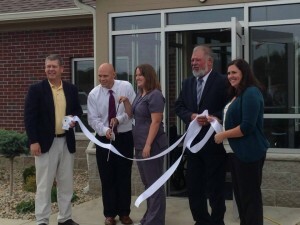 In 2012, WestGate Academy Conferencing and Training Center held its official ribbon cutting. In 2013, the Battery Innovation Center opened its doors, and developers are currently preparing to build a new hotel just over the Greene County line. The Tech Park is moving at full speed toward future development, interstate speed, to be exact. When the state announced the construction of I-69, connecting Evansville with Indianapolis, it was the beginning of a new wave of investment for the region. To date, the interstate is fully operational from Evansville to Bloomington, with the next leg (Bloomington to Martinsville) slated to open within the next year. New companies continue to flock to the park for the unique blend of opportunity and quality of life in the region. 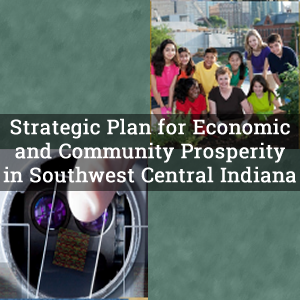 They know and understand that this hub of activity for the defense industry may be nestled in the farmland of South Central Indiana, but it continues to be an ideal – if unexpected – location for businesses to thrive and grow.